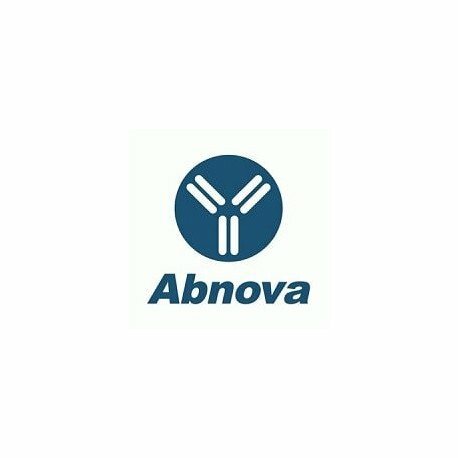 Product description: Rabbit polyclonal antibody raised against full length recombinant Bid. Immunogen: Recombinant protein corresponding to full length mouse Bid. 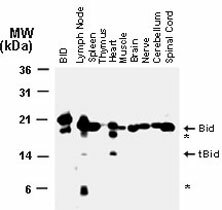 Application image note: Western blot analysis of Bid in normal mouse tissues using Bid polyclonal antibody (Cat # PAB0238) at 1 : 2000. BID = recombinant Bid. Arrowheads indicate the positions of the full-length (uncleaved) ~22 KDa Bid and the ~15 KDa truncated form of Bid (tBid) typical of the caspase-cleavage. Additional bands representing partial Bid degradation products are indicated by asterisks (*). Publications: Increased placental apoptosis in maternal food restricted gestations: role of the Fas pathway.Belkacemi L, Chen CH, Ross MG, Desai M.
Placenta. 2009 Sep;30(9):739-51. Epub 2009 Jul 18.